The urge to harvest food from the home garden tells me the Hawaiian Makahiki season soon will be upon us. When Makahiki starts, in early November this year, all feuding and all work in the fields end. The harvest is over, we remain friends, and it’s time to call on others and play—for four months! Today I pulled out 7-1/2 pounds of ‘uala, or sweet potatoes, of various shapes and sizes from the semi-circular patch out front. At the same time I plucked and saved the edible tender sweet potato leaf shoots. I rinsed and dried the greens and reserved them for sandwiches and salads. Adjacent to the ti leaf and panax hedge, the semi-circular bed of sweet potatoes is 85% harvested. I pluck and use only the growing tip of the vine. Any other part of the vine is too tough and not as tasty, in my opinion. I rinsed greens carefully under running water for some tasty crunch in a cheese sandwich. I also gathered kou tree blossoms that fell from above to make a saffron- or ochre-colored dye bath. What now? I prepared candied sweet potatoes and an uala leaf and tofu salad for dinner, and I reserved the kou flowers for later when I can organize a day of fabric dyeing and decorating with my artsy friends. I roasted sweet potato chunks in the oven and baked them a second time with butter, a little salt, brown sugar, and rum to make them taste like Thanksgiving candied yams! For this tofu salad, blanching the leaves and a vinaigrette dressing has darken the leaf color. How about a Makahiki party soon to enjoy the bounty? There are lots more sweet potatoes! Aloha, studio fans! Makahiki season is open in Hawai‘i and it’s the reason there’s been a gap in my posts. As with some other cultures, Makahiki is the time—between now and January or February of next year, when Makali‘i (the Pleiades constellation) is overhead at 8 p.m.—to take a break from working and warring, the time to give thanks to a successful harvest/year, the time to enjoy the success, and the time to play! Many folks don’t realize it’s perfectly all right to relax and do nothing, especially with today’s fast-paced-because-of-technology lifestyle. Since coming home from Italy I’ve felt a little out of sorts, not centered. I’ve decided to observe Makahiki and quit thinking too much about what project I’m doing tomorrow. Right now I’m feeling more comfortable arranging to spend good times with friends and relatives. As it should be. 2013 has been an incredible year of expansion and growth for me. I admit much of it was planned, that is, I intended to have new experiences and learn new skills. But the outcomes—after I’d planted the seeds and released them to the Universe to nurture—were so very surprising, so delightful, so supportive of my wish to create. It’s made me a believer of how to live a happy life. Just a few more notes . . . I promise you, the hard part is over. The next few weeks will be fun. • The final week of my “Hana Hou: Then & Now” fine art show with co-exhibitor Tamsen Fox at Ho‘omaluhia Botanical Garden. We just enjoy more visitors and sales through Nov. 29, 9 a.m. to 4 p.m. daily. Then we uninstall. If you live on O‘ahu, I hope you will have time to see it. • Several music gigs singing Christmas music to various audiences around town. Rehearsals with the choir are pau (finished). Now we just perform and enjoy. • The kids and grandkids—Miss Marvelous and her younger sister who turns 2 this week—will be home from Italy for December and through the New Year! That will be fun. All grandparents can relate to that! This past weekend DH set up the toddler’s bed. We can hardly wait to greet them Hawaiian style with lei. • Teaching: I’ve found a new classroom that can accommodate more students in my future art and Reiki classes. Excited to make the final arrangements soon. Meanwhile, a wreath-making workshop led by Yours Truly is already scheduled for Dec. 14 in Kāneʻohe. Let me know if you want to attend! • Eleven, I just counted 11, celebrations and parties are logged on the remaining calendar for 2013 so far. How fortunate. I look forward to socializing with my relatives and friends, young and older, from near and far, from school days to my newest relationships. You see, why work when we can play? Let’s take a little rest. We are so lucky and so blessed. I am very grateful. The moment I made this photo of Miss Marvelous and her mom, I knew I had our Hawaiian greeting card for this year. Everyone at Rebekah’s Studio—DH (Darling Husband), Alice Brown, Ula and I—wish you a Happy Winter Solstice! “With the winter holiday season upon us, most families are starting to get into the spirit. The signs include that real or imagined cold snap on Halloween night, slick merchandising catalogs overflowing from our mailboxes, store mark downs everywhere, and the lure of local craft fairs and festive events. “Conversations now include, “What are you doing for (fill in the holiday)?” and newspaper features carry tips on how to remain stress free. We want to remember family and friends and hope no one is left alone. As families extend generationally, geographically, and by marriage, there can be many decisions to make. “DH and I have a couple of philosophic ideas and old-fashioned traditions that give us a sense of peace. They link to our respective roots—Hawaiian Islands for me and Pennsylvania (Delaware County) for him. 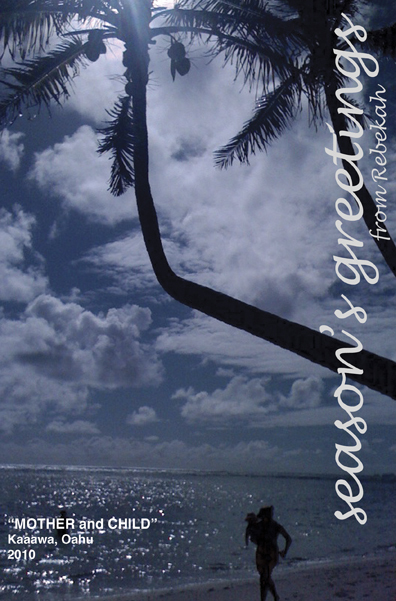 “One is to acknowledge and be mindful of the Hawaiian Makahiki season, roughly from mid-November through January (exact dates depend on the moon). The planting season is over, work is pau (finished), and warring ceases. It is the time of the god Lono. “The best of the harvest is dedicated to Lono in the form of ho‘okupu (offerings). The people give thanks, relax, socialize, play outdoor games, and generally enjoy themselves. No stress. It’s officially okay to play! “The other is adopted from Winterthur, Delaware, not far from DH’s birthplace. As tourists we visited Winterthur, a museum and the former country estate of Henry Francis du Pont. During his life H. F. du Pont collected whole room interiors of various periods, not to mention whole street fronts, and installed them in his mansion. “The museum decorates the rooms of this big house for Yuletide, and visitors can tour them around the same months of Makahiki in Hawaii. The holiday decor matches the period style of each different room. It’s educational and very festive. “When we visited, our favorite room showed how du Pont’s own family celebrated in the first half of the 20th century. The story was told that Yuletide, the time around the Winter solstice, was a time to visit and entertain friends, to rest and to celebrate a successful harvest. Children were seen but not heard. “Decorations consisted of a small table-top evergreen—adorned simply with cookies, candles and strands of popcorn and cranberries—that was set atop a pie crust table. Gifts were exchanged among immediate family members only and placed in a basket for each person. If the children behaved well, they could have the cookies!